Oh the name?? That was easy .. I’m not sure what I did, but there were some doozy of mistakes in this one … didn’t cut straight? Sew straight? Your guess is as good as mine – it was 10 years ago when I first made these blocks. And the basting! I started out doing thread basting – I didn’t think that I would have had enough pins for pin basting, so I figured – do each block separately as I’ll work on one block at a time. Well – it bloody well took forever!! It just dragged and dragged and dragged … I didn’t feel like I was getting anywhere with it(!) I also wanted to do thread basting also because sometimes I don’t pin-baste close enough, and I’ve had enough issues with my backs puckering lately that I didn’t want to add that sin to this quilt on top of all the others I’ve committed with it pfft. But the pins came out, and then I flew thru this .. and thru my pins too – so back to thread basting I went. 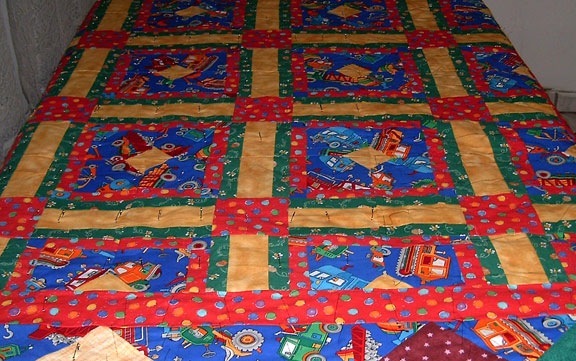 In this pic here you can see some of the issues that I created with this quilt. See the imaginative piecing I did here?? There’s other places just like all over the quilt – poor thing. I was hoping to get to get to the fun part tonite and actually print out the motif and get it sized right and start to trace out the 20 blocks I need. Not going to happen .. it’s almost 3am and I still have to press Reg’s shirt for the Regional finals (I think??) tomorrow in Sarnia .. (No I’m not going :D) They won the game on Sunday, and have to win in Sarnia in order to go to Ottawa for OFSSA – Let’s hope they win!! Tomorrow I’ll do the fun part .. maybe I’ll feel a bit better too .. Reg and I seem to have picked up a bug and are suffering from some coughing, sneezing, tender throat and sinus icks. Hopefully tomorrow I can start to quilt!! Wouldn’t that be nice! That is a funny name. If the shoe fits right. Pinning quilts is what I like the least about making quilts. I have a few that need to be finished. Very clever the way that you upsized the quilt! BTW, I use spray baste. Pins get in the way and thread gets caught (and is a pita). And since I have to spray outside, I also only baste at certain times of the year!! Brava! Brava! Great to see a finish on this one for you! So now the quilting fun begins. 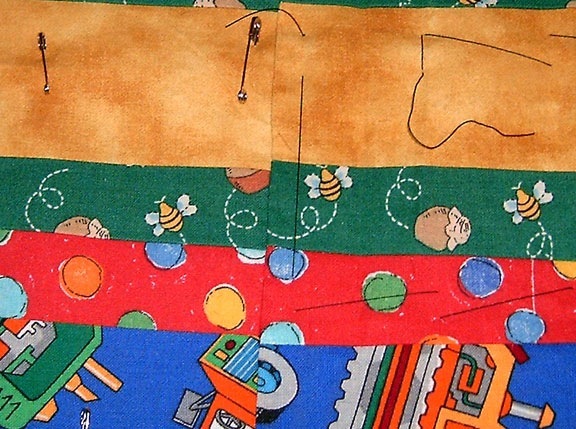 I have only one question for you Gracie–Where did you find the backing for his quilt? LOL in the closet I like to hide in? ROFL and as for quilting sins of the past? Aint no quilt cops here and don’t be so hard on yourself!